I am starting a new program for all of my customers! It is called Stamping Points and it is my way of saying "Thank you and I appreciate your business!". This will be made available to ALL of my customers whether it is via online, workshops, classes, local etc. 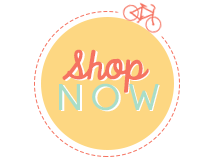 - Place an online order through my Stampin’ Up! website. - You may also email your order to me at margiecrafts@gmail.com and I will place the order for you. 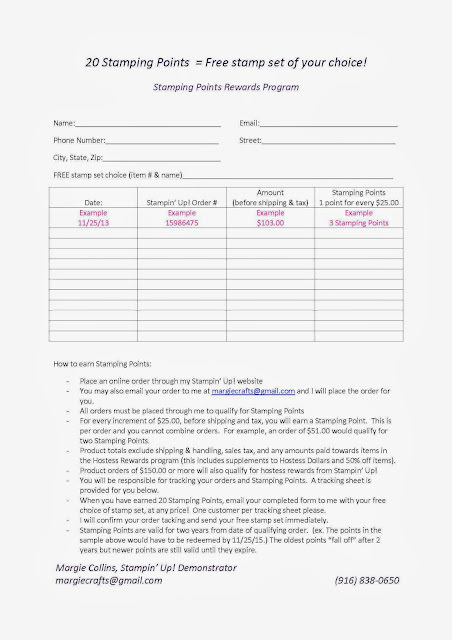 - All orders must be placed through me to qualify for Stamping Points. - For every increment of $25.00, before shipping and tax, you will earn a Stamping Point. This is per order and you cannot combine orders. For example, an order of $51.00 would qualify for two Stamping Points. - Product totals exclude shipping & handling, sales tax, and any amounts paid towards items in the Hostess Rewards program (this includes supplements to Hostess Dollars and 50% off items). - Product orders of $150.00 or more will also qualify for hostess rewards from Stampin’ Up! - You will be responsible for tracking your orders and Stamping Points. A tracking sheet is provided for you below. - When you have earned 20 Stamping Points, email your completed form to me with you free choice of stamp set, at any price! One customer per tracking sheet please. - I will confirm your order tacking and send your free stamp set immediately. - Stamping Points will expire 24 months from the initial purchase. (ex. The points in the sample above would have to be redeemed by 11/25/15.) The oldest points “fall off” after 2 years but newer points are still valid until they expire. Now is the time to start getting Stamping Points when you pair them with the Weekly Deals and Holiday Sale from Stampin’ Up!